I always enjoy finding dark ambient works that are a little different to what I’m used to listening to. Hidden by Sound Awakener, is one that departs from my ambient taste to quite a large degree, which intrigued and challenged me. Sound Awakener is a solo music project from Nhung Nguyen, a musician from Hanoi in Vietnam. She has been working on Sound Awakener since 2011 but has only now begun to release her work in 2014. In that time, she has developed her own techniques to bring about the sound that she has created, which tends to feature machinery, found sounds and other extreme sounds from musical instruments. Using intended clicks and distortion to create a hidden space. but not a shelter. This short album description is certainly verified upon listening to Hidden, a seemingly violent and jarring trio of tracks, but to label it as such and then move on would be to do it a great disservice. Around starts with what sounds like a printing press thumping away. It isn’t long before the sound distorts and becomes rawkish with variations in distance and timing. It put me in mind of what a machine might sound like if it growled at me. The latter part of the track slips into a quieter frame, giving the ear respite and the sensation of travel. My own imaginings saw me flying along an optical cable into the bowels of the internet, rings of light dancing past my eyes. Hidden put me in mind of someone hiding in a cupboard in a large abandoned room, the kind with rough exposed floorboards and cracked window panes. The track begins with shuffling sounds and movement, as if things outside the cupboard door are hunting for the hider. They sound insect-like but technological. Peeking through the crack in the door might reveal one shimmering with pixels. After a higher pitched sound, the multiple scuttlings are replaced by larger and more singular sounds, as if the brood mother has squeezed into the space and has taken up the search for you. This track starts with an undulating sound wave with hints of guitar and other less easily recognised noises. I think the best way to sum up this track is to start with what it made me think of. I had visions of a kitchen, sunlight shining through the window but some of the room in gloom. Hanging over the open doorway is one of those bead curtains that people use to keep the flies out. This track seems to give sound to the motion of the beads rocking backwards and forwards after something large has pushed through them, with the exception that momentum is never lost and they never settle down. It sounds energetic and swaying, the rhythm very pleasing and strangely relaxing. Hidden has to be one of the more challenging dark ambient albums that I’ve listened to. Someone unused to dark ambient or less eclectic in music tastes might have said “It’s just noise!” but it really isn’t. Whatever the noises and sounds presented to the listener, they create strange rhythms that draw the mind in and certainly create an effect. These rhythms are key to what makes Hidden something worth listening to. 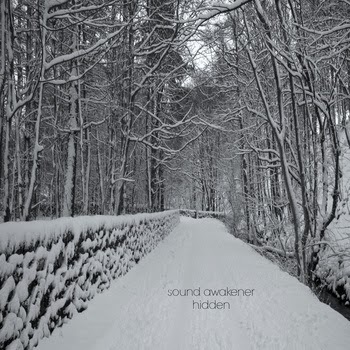 I really enjoyed listening to Hidden and I’m interested in hearing more of Sound Awakener’s tracks. If I had to choose a favourite track, it would have to be Diary as it almost lulled me to sleep a few times and I kept repeating it as it almost got to the end each time. I give Hidden 4.5/5. It’s not my usual brand of dark ambient but I am seriously thinking it should be. Visit Sound Awakener on Bandcamp here for previews and purchasing options.